See the entry for O. lindheimeri. 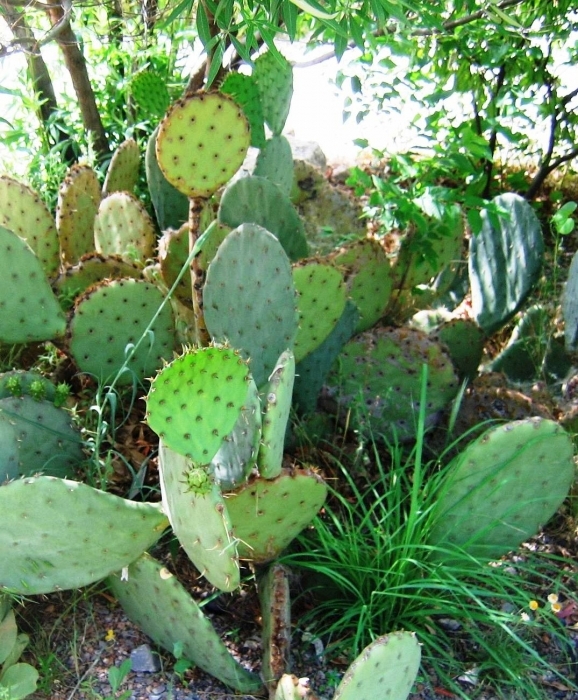 What is Opuntia lindheimeri subaramata? Opuntia lindheimeri subaramata is a prickly pear cactus that was described as a stand-alone taxon (O. subaramata) by Griffiths. It is the same cactus as O. engelmannii subaramata described by Weinger (Cacti of Texas, 1988). The cladodes are fleshier, thicker, “heavier seeming” and “denser appearing” than the cladodes of typical O. lindheimeri. This Opuntia makes thicker shrubs than the parent taxon. The plants may be shorter than the parent variety, but they can get large. The few spines are yellow and may be flat. They may grade to true dark brown without red (even nearly black) at the base, a characteristic that is unusual for O. lindheimeri. O. lindheimeri subaramata areoles may have few glochids or may have many glochids. The flowers are essentially like those of O. lindheimeri, as are the fruit and seeds. O. lindheimeri subaramata intergrades with regular O. lindheimeri, but it is a distinct prickly pear that occurs mostly at the western limits of the O. lindheimeri range. The authors have observed this Opuntia near Amistad National Recreation Area near Eagle Pass, TX; near Del Rio, TX; in the McKittrick hills west of Carlsbad, NM; and on the Edwards Plateau of Texas. It may occur north to the Lubbock, TX area. See the original citation (Spanish). O. lindheimeri subaramata may be hexaploid like the parent taxon, but at least one report suggests that it is tetraploid.